Chris - Today, quick transport links between cities mean emerging infections can spread globally and very rapidly. So scientists need a way of following the course of the disease and Pete Skidmore has been finding out how medical mapping provides an insight into the dynamics of disease spread. Pete - Plotting the spread of disease onto maps is an essential tool for government and health organisations trying to stem the tide of epidemics because it allows them to plan more resources such as vaccines and sanitation. To find out more, I spoke to Dr. Tom Koch, a medical geographer from the University of British Columbia in Canada. 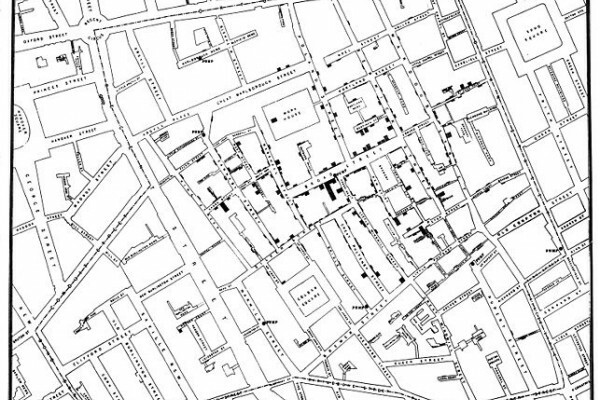 Tom - Medical mapping as a consistent tool in the study of public diseases began in 1796 with the study of yellow fever. It is the way in which we take a collection of events and then we plant them into a specific geography where we can have the relation between the occurrence and environment that either promotes or inhibits it. Pete - Thinking about the modern world now, obviously, there's a lot more mobility between cities. There's a lot of figures going around that no city is 24 hours away from any other city. Is there any way that we can adapt to cope with the different epidemiological factors with our much more mobile society? Tom - Globalisation really is just a speeded-up version of the mercantilism and then the industrialism which has long been in place. But it was really the Crusades, the travel between cities, which brought us the plague in the 14th century. It was globalisation and trade and it was the passage of people from one country to another which brought us cholera in the 19th century. So, the first thing to recognise is this is nothing new. It might have been speeded up some, but it's a difference of degree and not kind. What the rapidity of travel means is that it will be even harder despite all of our advances in technology to stop either the evolution of our microbial friends or the progression of the disease that they eventually hit upon. Pete - Infections may be able to spread across the world more quickly now than in any other time in history, but surely, with the advances in global communication and social media, it's easy to track epidemics. I spoke to David Pigott, a DPhil student at the University of Oxford, who studies the different ways we build disease maps. David - We believe systems such as HealthMap and BioCaster, GenBank and potentially social media can help. HealthMap and BioCaster are websites that use data mining algorithms to trawl the web looking for non-conventional data sources. So, they look at news articles, other websites that wouldn't ordinarily come up if you're using a standard academic literature based search engine. And combined, they're bringing up about 400 new posts everyday pertaining to different diseases. And then finally, Twitter and social media at the minute represents an uncertain but very promising route nonetheless where we can use the tweets if they're relating to a disease, for instance. That would be the hardest task, trying to identify what key words are critical for which disease and trying to use information from that. But Twitter is a very noisy system when it comes to disease reporting. Previously, people have identified that Twitter trends for influenza and dengue predict trends in case reports from conventional systems like the CDC in America by up to 2 or 3 weeks before. So, it has the potential to help, but we need to do a lot of work to determine the accuracy of those data points. Pete - So, you mentioned BioCaster and HealthMap. Have these at all helped in the recent epidemics like H7N9 and SARS-like corona virus? Tom - HealthMap and BioCaster have been used in maps particularly just picking up news reporting in China since but yeah, given there's a lag time between case reporting and national health service reporting level, it's the hope that HealthMap and BioCaster could try and reduce that lag in delay especially when it comes to a very novel infection where actually, it's the speed of information gathered that's the most important aspect. Pete - So, where will the next pandemic come from? Tom Koch has the answers. Tom - We know that the next pandemic is almost a certainty, I would say, within 10 years and it will start as pandemics always do, in a type of area which is densely settled, where there's huge social and economic inequality such that there will be a dense group of people living in poor surroundings often with their animals and then it will spread from there to a primary city and from there to other primary cities. So, it may be that it starts in China or Vietnam, a place where we have huge densities and huge income inequality and then it will spread with travellers first in a local area where the virus or bacteria gets set and then it will grab an airplane and fly on off. Pete - And is mapping prepared for that? Tom - Sure! As the data comes in, we can map it and we can very quickly predict, depending on the nature of the specific microbe, its rate of diffusion to primary and secondary sources. We know how to do that. More important is, can we, and why are we not, identifying the places where the disease is likely to come, and putting our international energy into the type of development which will limit the opportunity for the virus and bacteria to proliferate, mutate, and then spread. Kat - So, new diseases are constantly emerging, but hopefully, new methods of mapping them will allow us to stop them in their tracks.